Winston Day Chief looks for a deflection in front of the Arizona net while Jason Morgan, left, and Ian Schultz defend for the Sundogs during a game on Nov. 9. Winston Day Chief, second from left, celebrates with teammates Konrad reeder (21) and Tristin Llewellyn after scoring a goal against Arizona on Nov. 9. Winston Day Chief chases the puck along the boards during a game against Arizona. Winston Day Chief has a reputation for being a soft-spoken guy. He’s just not a big talker. Lately, however, his play for the Rapid City Rush has been speaking volumes. Day Chief has scored four goals and two assists in Rapid City’s last five Central Hockey League contests, including a pair of goals and an assist in Rapid City’s 4-3 win over the Missouri Mavericks last Friday night. Day Chief a 6-2, 190-pound forward who will celebrate his 26th birthday on Saturday, shares a line with veterans Konrad Reeder and Jesse Schultz. 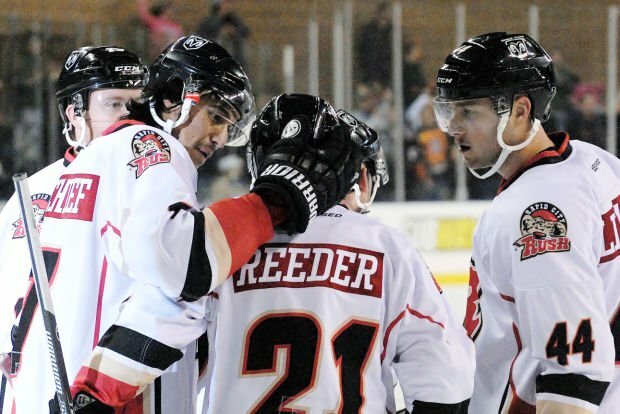 His five total goals are second only to Reeder’s nine on the Rush roster. His nine total points tie him for fourth with Jared Brown and Eric Giosa among Rapid City skaters. Day Chief first signed with the Rush as an amateur during Rapid City’s playoff run at the end of the 2011-2012 season. He was finishing up his final year of college hockey with the University of Lethbridge in Alberta where he scored 23 goals and 24 assists in three years with the Pronghorns. He skated in four games during the playoffs that year, but impressed with his tenacity on the ice. “He plays the game the right way," Rush head coach Joe Ferras said. "He plays hard. He finishes his checks. He’s strong on the pucks and he’s got great hands for a big man." Day Chief credits meshing with Schultz and Reeder. “We open more chances for each other,” Day Chief said. “It could be so many things I’ve learned, more patience with the puck or more confidence in myself. “The biggest thing is the confidence,” he said. Day Chief signed with the Rush for his rookie season last year, but just three games in, during Rapid City’s home opener against the Denver Cutthroats, he suffered a broken shoulder sliding hard into the boards and missed more than two months. He returned to action in early January and completed the regular season with nine goals and 12 assists in 37 games. “We saw the last 20 games last year how good of a hockey player he was,” Ferras said. Hockey is a staple of growing up anywhere north of the border and that was certainly the case in Day Chief’s Canadian hometown of Standoff, Alberta. A member of the Blackfoot Kainai Nation (Blood Tribe), Day Chief shares his first name with his grandfather and credits him with instilling his determination on the ice. Day Chief also isn’t afraid to lurk in front of an opponent’s net when the Rush are on the man-advantage. He has one power play goal and an assist to show for taking the abuse that comes from prowling the tough areas. “He’s fearless. He doesn’t think twice about going in front of the net and getting hacked and whacked,” Ferras said. With his new-found confidence on the ice, linemates are noticing him speaking up more. Ferras thinks Day Chief is on the cusp of a breakout year for the Rush, who are off to a 10-1-0 start going into Friday and Saturday’s road games at Wichita. “I think he’s just starting to scratch the surface about what kind of hockey player he can be,” Ferras said.